When your company needs quality graphite and carbon, put your trust in NAC Carbon Products, Inc. (NAC). 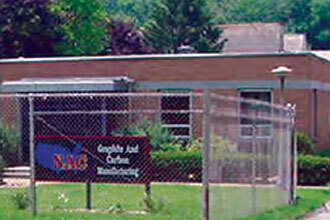 With nearly 60 years of experience, we are experts in the manufacturing of graphite and carbon products. Our products include graphite and carbon rods and blocks; plus purified, granular, molded, baked and extruded graphite and carbon. In addition, we offer graphitization and toll carbon baking services. Our goal is to provide quality graphite and carbon at competitive prices, shipped when you need it. NAC's production facilities – located in Punxsutawney, PA – feature more than 100,000 square feet of manufacturing space, designed for efficient handling of your order from receipt to final packaging and shipping. Our facility is equipped with a complete range of extrusion, baking and graphitization equipment. We will manufacture graphite to your specifications and formulation. We can private label products for you.